Display tub showcases Baumgarten's Scissors in assorted colors. Opening at the top allows easy access to the scissors. Tub includes a lid to protect contents from dust and is made of clear polypropylene. Scissors feature a translucent top made of neoprene that locks into place for safety. 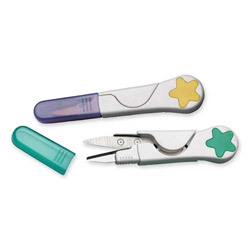 Compact design of the scissors makes them perfect for clipping newspaper and magazine articles. Use them for travel or sewing jobs and needlework. Scissors are made of stainless steel. Meet or exceed standard for RoHS compliance for lead, mercury, bromine, chrome and cadmium. Freight Delivery: $71.02 - for 1st unit. Due to the size, shape and/or weight, this item will ship via a common carrier or freight service, incurring freight delivery fee. Please allow 3-10 business days for freight deliveries. *Each additional unit is charged a percentage increase to the original freight delivery fee, not the full amount. Assorted Scissors from Baumgarten's! 39 In Stock today.